Mother Teresa was born in 1910 in the Albanian provinces of the Ottoman Empire and baptized Gonxha Agnes Bojaxhiu. Her mother Nikola had a strong influence in shaping her personality. After Agnes’ politically influential merchant father died suddenly, what was a financially sound family was suddenly left in poverty. However, her mother Nikola still continued helping the poor, and encouraged Agnes to do the same. Nikola often said, “When you do good, do it quietly -as if you were throwing a stone into the sea.” This lesson remained with young Agnes, who would later become an icon of generosity and charity. She joined an Irish convent at the age of 18, and became known by the name Sister Mary Teresa. A few months later around January 1929, she arrived in the city of Calcutta, then known as Kolkata. She began teaching at St. Mary’s School for girls, where she also served as headmistress. On 10 September 1946 during the train ride from Calcutta to Darjeeling for her annual retreat, she saw abject poverty around her in a complete different light, and received her inspiration to do something to improve the lives of the poor. In 1948, for the first time, she wore the symbolic blue–lined white cotton sari, and launched the Missionaries of Charity to serve the poor. In 1979, she was awarded the Nobel Peace Prize for her selfless work to uplift the poor and her efforts to bring an end to the suffering caused by sickness and poverty. The best proof of this would be Mother Teresa’s feet which over time became deformed and knobby. Mother Teresa and her sisters would depend on donations for all their needs, including their footwear. When any such donated shoes would come in, Mother Teresa would always choose the worst pair of shoes for herself. 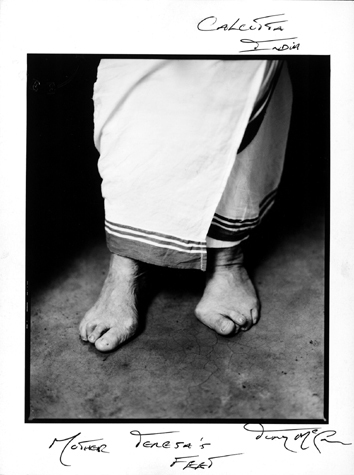 Because of such ill-fitting shoes, Mother Teresa’s feet eventually got damaged over time. Some people have accused Mother Teresa of accepting large amounts of money and funds as donation from various powerful figures, even mingling with influential politicians and businessmen who were accused of objectionable activities. However, why should it be assumed that people who are politically controversial should not be allowed to offer support to orphans, the sick and suffering? For example, Mother Teresa’s integrity was brought under question, when Palestine Liberation Organization leader Yasser Arafat insisted on meeting her while on his visit to India in 1990. 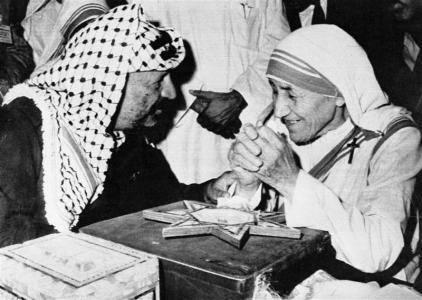 Mother Teresa, who was a spiritual person, probably knew that it would be hypocrisy if she propagated the idea of universal love and peace – but then acted in a judgemental way against Arafat. Being a compassionate woman by nature, she accepted Arafat’s request. Her commitment to her mission was ardent, and she even encouraged the young nuns under Missionaries of Charity to keep their focus only on their noble mission – to be Christ-like and to see Christ in every person. The third woman to join the Missionaries of Charity, Sr Gertrude completed her MBBS from Calcutta University and was awarded a gold medal for her academic brilliance. As she was thrilled to share this news, Mother Teresa said to her, “you don’t need a gold medal to serve Jesus and the poor. Return it. Someone else could benefit it more than you.” Sr Gertrude then returned the medal. Such was their commitment to their cause. Pope Francis announced that Mother Teresa would be canonized as a saint on 4 September this year. She was earlier beatified in October 2003 by now deceased Pope John Paul II, after which she was known as Blessed Mother Teresa. The decision to elevated Blessed Mother Teresa to sainthood was taken after a second miracle was witnessed through her intervention, when a Brazilian man was medically proven as cured of multiple brain tumours just by the prayers offered to her by the man’s family and loved ones. The first miracle was when a 30-year-old woman revealed that she was cured of a stomach tumour after praying to Mother Teresa. As the investigations conducted by the Vatican could not determine any scientific reason for this cure, it was declared as a miracle. 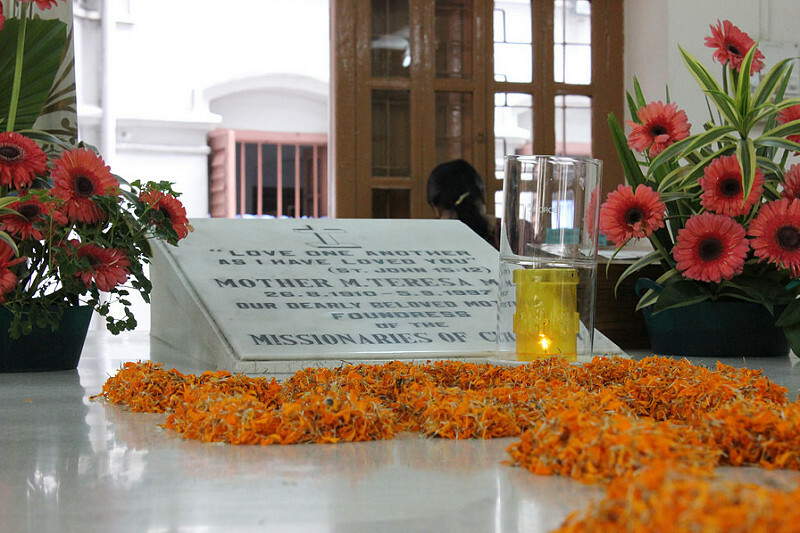 Presently, Mother Teresa’s tomb rests in the Missionaries of Charity’s Kolkata centre, and the mission has spread across charity centres worldwide – including Africa, North America, Europe and Australia. Blessed Mother Teresa will soon be known as Saint Mother Teresa, and has taught mankind many wonderful things about reaching out to fellow human beings.